with the one you think will be best for your needs. city and state : White Lake, Mi. MY STORY: My father was an alcoholic for years and suffered with DT's into his later years. When I was married for the first time, I married an alcoholic. To this day he still drinks. My eldest son used drugs while in Jr. High and through out High school. This is where I first became involved with alanon & narcanon as a parent. that I help him with the alanon, and narcanon support here on line. If I can be of service to anyone here please feel free to email or call. MY STORY : I believe i was born an aloholic/addict, the first feelings i remember feeling fear and lonliness. My dad from alcoholism at the age of 50.I began drinking at the age of 16 and immediatly those feelings of fear and lonliness were gone. I remember thinking this is the answer to all of my problems, I felt good for the first time. I immediatly srted having blackouts and assumed that everyone who drank had blackouts. I'm going to try to make this short. My first marriage ended because of my addiction. My husband at that time drank and did drugs with me, but he would stop at a certain point and I never had enough of anything. I went to my first treatment center shortly after my divorce, by that time I was using alot of soapers and had just been entroduced to coccaine. I didn,t stay sober, but started going to AA meetings, met a man I met in AA and married him. That was a disaster, he began a gambling addiction I was clean, but as sick as could be.I did go to college d! How I can help someone: : By sharing my experience and hope. How I can help someone: : by sharing my experience strength and hope so that they don't have to make to same mistakes that i did. OTHER COMMENTS: : i need help myself in another i'am getting to be homeless my husband is leaving me for another women and wants to leave the house and all the back bills on me. MY STORY : I called myself a linen closet drunk. I put on a good face of wife and mother to a teen son and a grown daughter. I started drinking wine to make the ironing seem less of a bother and progressed to using it to get through the day. When my teenage son ran away from home with the next few years of upheaval and I wine continued to help. But all of this progressed until I had started to include liqour to my daily drinking I became unable to stop on my own and when my daughter found me in a mess one day, I was told the family was feb up and they were going to do something. I quickly told them I had phoned A.A. which we insisted on my doing again and two ladies came out to tell me what meeting with other alcoholics could do. I floundered a bit until Aug of 1978 and then after a disasterous slip finally made it with a very good sponsor and who made me do service work. Eventually over the years I have sponsored many and worked many years on the office phones. I help! OTHER COMMENTS: : After thos disasterous years of my dependancy on the Bottle I have achieved many things like going back to college when in my sixties. I toyed with the Idea of becoming a Minister of a New thought church but after a lot of involvement I came back to the simple Twelve Step Program and often say at meetings thank goodness I became an Alcoholic or I would never have found this spirtual program. MY STORY : My name is Adina and Im an addict. My journey in addiction began when I was 16yrs old, and I had my first taste of narcotics. It was grand; or so I'd thought. I would use, and abuse dr.s and pharmacies to find ways and means to get more. I lived to use for sure. I would make up what illness I had to to get what I needed. Then the day came when I actually did become seriously ill and had a hysterectomy at the age of 31. The drugs for pain did not work as I'd built up a tolerance. I resorted to stealing drugs from my grandmother. My aunt threatened to turn me in, so I had to start going to meetings. I did not want to. I began to go and something started. I got a sponsor, who is no longer my sponsor, but today- my best friend. I trusted that one woman and now my life is filled with love and hope. I have a great life today, for which I am truly thankful. Thank YOU God, and NA for saving my life. How I can help someone: : I can offer my experience, strength and hope. I can identify with feelings, and like giving back what was so freely given to me. I have unconditional love in my life today because of what this program has given to me. OTHER COMMENTS: : I would just like to say, thank you to NA and for reaching the message to the addicts/alcoholics/co-dependants that still suffer. This is a grand forum, and I hope to become a part of it. MY STORY : i am 47 married for 23 years.l two children ryan21 and jamie 10. grew up in new jersey. eldest of 8. irish catholic. alcholic parents. mom eventually in the aa program. died sober in 1990. i adored my mom but she was a raging personality with a raging alcohol addiction. her ovarian cancer and subsequent hospice care, for which i was primary caregiver, sent me over the edge. i was always a liar, a thief and a cheat. the look good was always most important. nothing was ever good enough. I probably was 'using' long before i realized. i was treated for migrane headaches since the age of 14. i am sure now that i was using pills before alcohol ever became an issue. but i was unable to admit that. i had a great time in college in los angeles. met and married rodney who still is my husband (a normy ). we moved to Saudi Arabia and had our son ryan in houston, tx. in 1981. my drinking was very much social during all of these years. My pill taking was not. I took pills to get rid of the pain in my head and eventually realized they got rid of the pain in my heart, my feelings of less than. i always spenttime getting prescriptions while travelling or new doctors when moving. doctors or out of pills, i never drank and did pills because i was afraid. Eventually jack daniels became the obivious choice. it got me out of myself and was a lot less complicated to get. once my mother died i felt i was doomed. I went back to my family and continued the drinking i'd started when i was with my mom back east. i had my second child in march of 1992. i did not drink during that pregnancy but i still took my pills in the beginning. i have begun to fear that my actions may have caused or contributed to his current learning problems...though not terrible my guilt is. i have yet to share this as it is a new admission to self. i was terrified of my new child. i felt doomed, crazy and overwhelmed. i shut the blinds and started drinking at 2 in the afternoon. i went out only when i had to. my life was terrible even though i had everything in the world. the swirling in the personal drain of my life just got faster. i drank more and more. eventually it just stopped working but not before i spent most days on the bathroom floor by 5 in the afternoon, praying to throw up so i could get my familly fed and bathed and in bed. i hated myself. i was totally empty. i felt no desire to actually kill myself but i didn't think i would be missed. the poster child for spiritual bankruptcy. I called aa. I went to my first couple of meetings with a couple of bracers in me but they just told me to keep coming back. and i did. and here i am. i love being a part of aa. I believe it is a life long journey. it isn't always easy but i go to several meetings a week. i do service where i can i would like to do service here if i can. i am about to get a new sponsor. i will be going through the steps again (our mutual sponsor recently died) soon. I have been through just about every kind of abuse there is. I have been on my own since I was 14 and it was at this time I turned to drugs and alcohol to hide the pain. I continued to use for almost 30 years, cocaine being my drug of choice and was on the verge of suicide as I didn't want to live in this hell anymore. Then one night I came home after a 3 day binge, got down on my knees and begged God to either help me or let me die. I have never been the same since as I surrendered my life to Jesus Christ that night. Not only did he take my addictions from me, he has enabled me to take my past and turn it around to bring glory to his name by helping others. He led me to the tables of NA after he had taken my addictions from me, to learn to open up to people and I thank God for the loving support and understanding I got there. 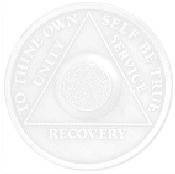 I will be celebrating 31 months clean on Nov. 17th. I am here for anyone who needs someone to talk to, needs support and help working the 12 steps. Let me give you the gift that has been given to me, as it is not a gift until you give it away. And you my friend have a miracle waiting for you right around the corner, all you have to do is WANT IT! Special Training & Education : I am attending college working toward a degree in Human Services which includes classes in all forms of drug and alcohol abuse. I also sponsor people on line and at my homegroup. I also have worked at various shelters with people in addiciton and recovery.